All of our Instructors are DMV licensed and bonded, but we go far beyond minimum requirements. Each Instructor is trained according to our internal Training Program developed over our years of experience, with continuous review at regular staff meetings and during training conferences with the Driving School Association of California. Many schools have just a few Instructors; we are proud of our experienced and diverse team whose commitment is to provide you with skills that will last a lifetime. Dan has devoted over 30 years to teaching precision driving, from European racetracks to California teenagers, from evaluating the driving abilities of seniors to winning a racing class championship. His background combines a Marketing degree and career in finance with a deep passion for driving to set very high standards as the Owner of the driving schools. Dan is the primary teacher of our Drivers Education classroom and also volunteers as Chief Instructor for the Tire Rack Street Survival® teen driving program and for the BMW Car Club. Dan rotates through several cars in our fleet to make sure they all stay up to our standards. With over 40 years of experience as a Physical Therapist, Penny is devoted to creating new possibilities for people with physical disabilities. As a Driving Rehab Specialist for more than 10 years, she has focused on training disabled drivers with a wide variety of special needs as part of the Sharp Healthcare network. Penny is DMV-licensed through American Driving School and teaches in both a Buick Park Avenue (with hand controls and a left-foot accelerator) and a new minivan equipped with 3 styles of hand controls and a wheelchair ramp. Alex is a second-generation Instructor whose mother has been teaching drivers for over 40 years. He absorbed a lot of her skill and dedication over the years and loves helping new drivers to gain confidence behind the wheel. Alex works great with people due to his prior career working in high-end hotels. He teaches in both East County and the coastal area, and drives a 38 mpg 2016 Toyota Corolla. After his career as a teacher for the San Diego Unified School district, Vic retired and decided to join our School. Part of his background was teaching Drivers Education, back when it was offered in the public school system, and he missed interacting with teenagers and helping them to learn some of the most important skills in their life. Vic is one of our most-requested Instructors due to his calm and pleasant style. He uses a comfortable and spacious 2009 Toyota Camry. Jim has spent his many years as an Instructor developing a versatile approach to teaching drivers with widely different needs. As our in-house expert on disabled driver training, Jim's mid-sized 2013 Dodge Dart is equipped with removable hand controls. He understands the special requirements of senior drivers, providing patient instruction throughout San Diego County for seniors, teens and disabled drivers. Jim also teaches some of our Drivers Education classes. Coleen is trained as a Driving Rehab Specialist for teaching disabled drivers, providing them with new skills to bring mobility and freedom back into their lives. As an Occupational Therapist, Dana works with drivers from 16 to those in senior years, and also many combat-wounded veterans. With her DMV license at American Driving School and association with Sharp Healthcare, Coleen teaches in both a Buick Park Avenue (with hand controls and a removable left- foot accelerator) and a new minivan equipped with hand controls and wheelchair access. Luke is a native Californian who enjoyed teaching drivers how to master a manual transmission long before he made this his career. Talk about patience! He is an auto enthusiast who has worked at dealerships and auto parts stores, with an excellent customer service background. He really enjoys interacting with new drivers and their parents, and he lives and works in East County. Luke teaches in a Hyundai Sonata from our Green Teen fleet. Sonya is an experienced Instructor who worked for another driving School for 5 years before joining our Team. As a mother of two teenagers, she taught both of them techniques for confident driving, and she really understands the importance that parents place on the safety of new drivers. She and her family have lived in North County for 28 years, so she knows the roads and the traffic challenges very well. Her teaching style combines friendliness and thoroughness to help new drivers to get a great start. Sonya instructs throughout North County in a clean and spacious Hyundai Sonata from our Green Teen Driving fleet. Our Business Office is open weekdays from 8:30-6 to answer questions, schedule lesson appointments for all Instructors, and process credit card payments. 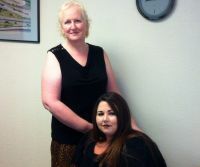 Our Office staff includes Office Manager Karen Rhoades and Assistant Office Manager Lauren Fields who provide helpful support to our Driving School clients, and they are ready for your call.